Hey! 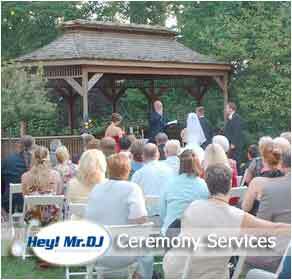 Mr. DJ also offers its services at your wedding ceremony! We can provide a portable, smaller sound system along with wireless lapel or headset microphones, so that everyone present for your special day will hear your vows, promises, and words. Normally we would attach a sensitive lapel microphone to whomever is performing the service, and that alone is usually enough to pick up your voices as well. We can set up a small portable sound system virtually anywhere, and can even provide background and ceremony music. Additional fees may apply, so be sure to ask about our ceremony services if this sounds like something you may be interested in using.